Old Pike is home to an 18 hole private disc golf course. The course has a wide variety of shots and difficulties among the holes and even has a few with water hazards. 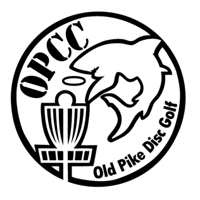 The Disc Golf Course is available for all members of Old Pike Country Club. We offer a Disc Golf only membership for $50 annually. Becoming a Disc Golf Member allows you access to our 18 Hole Disc Golf Course only. Disc Golf members must have their membership bag tag with them when using the Course. This membership does not allow access to any of Old Pike's other amenities including the Pool, Tennis Courts, Club House, Social Events and Discounts on Summer Athletics or Facility Rentals. If you are interested in a full membership click the link below. Disc Golf Guest fees are $5 per round and the guest must be with an Old Pike Member or Old Pike Disc Golf Member. Want to become an Old Pike Disc Golf Hole Sponsor? Disc Golf Hole Sponsorship is $100 annually.